Most UFC titleholders, when they first win the belt, say they need to defend it at least once before they feel like they’ve certified their position as a champion. Current UFC middleweight champion Chris Weidman is no different. The fact that his first defense is against Anderson Silva, the man he won the belt from, does, however, add a little spice to the dish. “I feel the same as a lot of other champions. 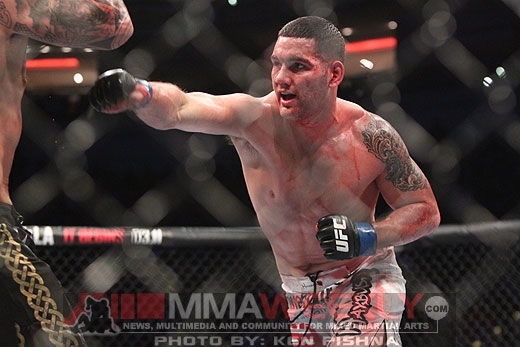 I feel like to solidify my championship, I need to defend my belt especially going in against the same guy and everybody saying it was a fluke,” Weidman told MMAWeekly.com recently. Weidman puts his belt on the line against Silva at UFC 168 on Saturday at the MGM Grand Garden Arena in Las Vegas. The oddsmakers, of course, are putting a little pressure on Weidman, making him the underdog in the rematch from the moment it was set. But even the oddsmakers are stronger believers in Weidman since he won the first bout at UFC 162 in July. Prior to UFC 162, Silva was roughly a two-to-one favorite at -240 (bet $240 to win $100) compared to Weidman’s +220 (bet $100 to win $220), according to MMAOddsbreaker.com. The gap closed considerably when the rematch was announced with Silva still the favorite at -140 and Weidman at +100. While public opinion seems to sway increasingly more towards Silva regaining his belt, that has yet to be reflected in the betting lines. The spread is slightly wider, but not by much, with Silva at -155 and Weidman at +135 on Thursday morning. That, however, is lost on Weidman, who said that the internal pressure he puts on himself is greater than any external pressures that anyone can manufacture. “I still feel like, you know, I have everything to lose in this fight. Like I said before, I need to win this fight to solidify me as champion and I want to go on and achieve a lot of my other longterm goals I have in this sport,” he said in a UFC 168 media conference call. There are the additional media demands, more fan notoriety, and everything else that comes with being a UFC champion, but Weidman sees them merely as distractions, not so much pressure. 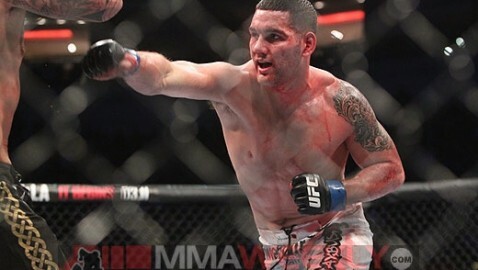 Prior to UFC 162, Weidman had been sidelined for a year. During that time out of the Octagon, he dealt with an injured shoulder and the devastation of Hurricane Sandy driving the native New Yorker and his family from their home. That is pressure. He feels that he’s in a good headspace for the rematch, confident as ever. In fact, he feels like he’s in a much better position than the first time he met Silva. He has no doubt about that. “100-percent, I know it’s going to be a better version of me,” said Weidman. “For the last camp, I went through hurricane Sandy, two surgeries, a year layoff. And even though, I wouldn’t let those excuses get in my mind before that fight. I didn’t make any excuses in my mind for why I should lose. This time, there’s really no excuses for me to lose. It’s that improved version of Chris Weidman that hopes to silence the doubters and put a stamp on his UFC middleweight championship.